Motorsports of all types garner huge numbers of marketing and brand impressions, across all conceivable product categories and demographics. 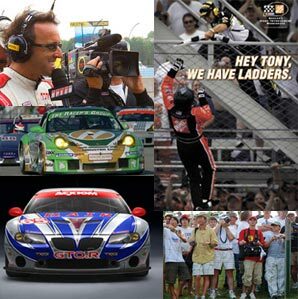 Racing is an advertising tool that reaches every market segment, from NASCAR’s “beer and pickup truck” crowd to Grand Am’s corporate executives to Formula 1’s international monied set—and everyone in between. It’s a relationship marketing tool that forges relationships in the only sporting venue where sponsors are welcomed as team members. It’s a media magnet that provides international television, radio, newspaper, magazine and internet coverage. And the combination creates an opportunity unequalled in other marketing venue. Racing Means Business creates successful partnerships between the sponsor and the motorsports venture. For more information, visit the Racing Means Business Website, www.racingmeansbusiness.com.